Bold, simple, and elegant. Perfect for any application - Now with Thinner Borders! Simplicity and elegance defined the original NOC deck. Now we have made it even better. The NOC v2 deck gets to the heart of the cards themselves and eliminates distractions. The deck has a striking back with a solid bar of color and a new thinner white border. This puts the emphasis on the work you do with the cards, not on the cards themselves. Custom box, ace, and jokers. The custom box matches the minimalism of the cards and carries an inspirational quote about the art and philosophy of keeping your mind, body, soul, and possessions free from clutter and distraction. The Ace of Spades and Jokers also carry a minimalistic yet attractive design. The court cards have been simplified and carry a color scheme that reflects the NOC lineup. Marking System & Free Video with Purchase. The NOC v2 backs have also been marked in a subtle yet easy-to-read manner that allows you to know the SUIT (not value) of any card at a glance. When you purchase the NOC deck, you will receive a free video download starring Alex Pandrea that teaches you how to use the marking system, as well as use the included duplicate card to perform amazing feats of magic. 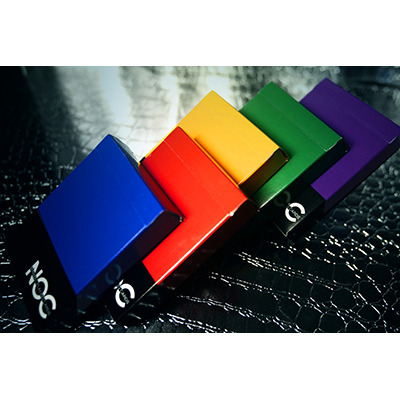 Because of the simple design and vibrant color, the NOC deck is perfect for any application. Whether you're into a weekly poker game, performing magic tricks, flourishing, or collecting, the NOC v2 deck is a perfect option. The NOC v2 deck is available in 5 vibrant colors to match any mood, wardrobe, or style. Collect them all!